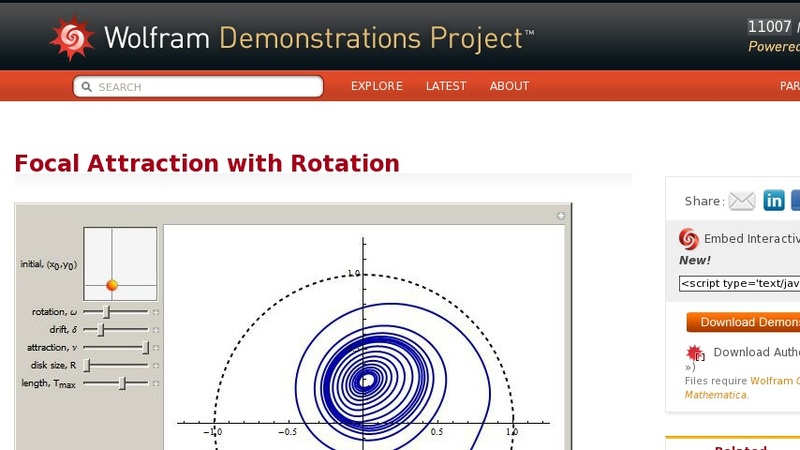 This Demonstration uses Mathematica's ... to plot trajectories of the Markus–Wilson model of focal attraction on a rotating medium. This dynamical system is parameterized by four positive parameters, ... , ... , ... , and ... , which correspond to physical parameters of the model: ... describes the rotational speed, ... ... quantifies the radial drift in the model (the default is zero, i.e., no drift), ... is the magnitude of the focal attraction whose source is at ... in Euclidean coordinates, where ... is the size of the rotating disk. To see how the trajectory develops through time (and hopefully its asymptotic behavior), autorun through the ... parameter. For large ... this may result in slow rendering of the smoothed curve. The following equations govern the time evolution of this system: ... , ... . The solution may not converge rapidly enough to be meaningful for all parameter combinations, in which case warnings will arise. We have attempted to remove most of the offending parameter combinations. However, the parameter space is complicated and one also does not want to remove too much of the content.